Lucca, located halfway between Florence and Pisa, is a mid-size (89,000 pop.) ancient medieval city on the Serchio River in the Tuscany region of central Italy. It was first inhabited by the Romans in 180 BC. Known for the well-preserved Renaissance-era walls encircling its historic city center and its cobblestone streets, the broad, tree-lined pathways along the tops of these massive 16th-century ramparts are a popular pedestrian promenade for strolling and cycling. It includes many medieval basilica-type churches, wide piazze (plazas), ornate palazzi (palaces), interesting museums, and, of course, numerous fabulous restaurants serving delicious local Lucchese cuisine. Giacomo Puccini, the great opera composer of La Boheme and Madam Butterfly, was born in Lucca and his house is now a museum. You will stay 7 nights in an historic and authentic stone agriturismo, located in the beautiful and tranquil countryside of Tuscany, approximately fifteen minutes from the historic walled-city of Lucca. An agriturismo is a rural farmhouse (under this family’s ownership for four generations) that offers guest accommodations and locally-produced honey, olive oil, wine (which are available for purchase), fruit, and vegetables. The lodge, surrounded by a lush-green forest and walking trails, is recently renovated and modern, with full bedrooms, bathrooms and kitchenette facilities. There is also a sparkling pool on the property for cool dips on hot days. We welcome, value and respect everyone from all spiritual paths and walks of life. Your Hosts, Marian and Garrett of Western Spirit Enrichment Center have been offering (non-religious and non-denominational) spiritual retreats to individuals and couples in Sedona, AZ since 2001 and have experience guiding thousands of guests on their spiritual journey. 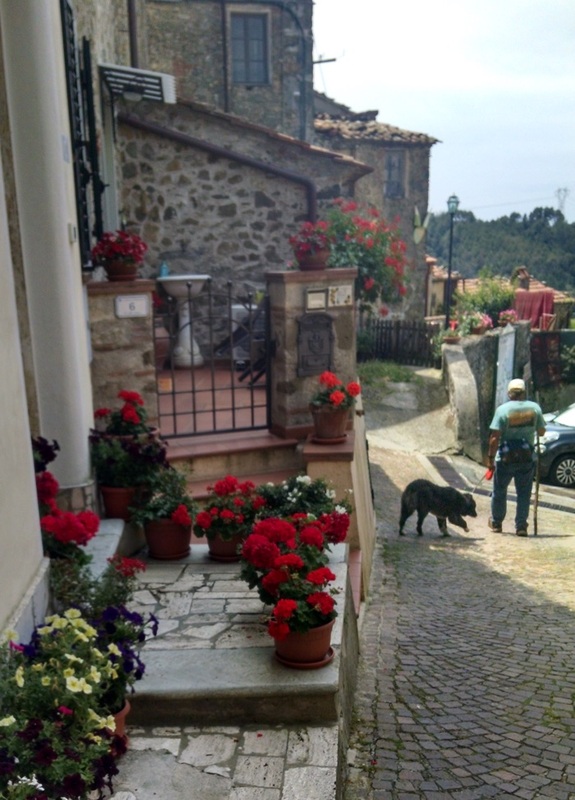 Marian and Garrett have visited Italy numerous times and have lived in a small village near Lucca. They are quite familiar with the area, local attractions and enticing restaurants. Marian’s Italian language skills will enable our retreat guests to easily communicate with the friendly locals. Sunday Evening: We will meet and share a wonderful evening meal as we review the week’s agenda. 9:00am – 12:00pm: 2 workshops. 12:00pm – 5:00pm: Lunch and tour of the medieval walled-city of Lucca. 7:30 – 9:00pm: Dinner at a local restaurant (ristorante). 12:00pm – 5:00pm: Lunch and trekking on the Via Francigena trail, an ancient road and pilgrimage route traveling from Rome to the Alps of France. Dating back to at least the year 725, it was one of the most important roads of travel and commerce from Rome northward. 7:30 – 9:00pm: Dinner at a local ristorante. 9:00am – 4:00pm: Visit to the Tyrrhenian Sea in Viareggio or Lido di Camaiore for sunning, swimming and shopping. Afternoon & Evening: Free time. 12:00pm – 5:30pm: lunch and tour of the exceptional Villa Reale, once the home of Napoleon’s sister, the Duchess of Lucca Elisa Bonaparte Baciocchi., and its numerous renowned gardens, waterfalls and botanical rarities. 7:30pm – 9:00pm: Dinner at a local ristorante. 8:30am: Farewell breakfast and free time the rest of the day. Nearby Pisa and its iconic leaning tower and nearby Cathedral and Piazza dei Miracoli. Florence, the birthplace of the Renaissance and the home of the Uffiizi Gallery, the Accademia Gallery (home to Michelangelo’s David), the Santa Maria del Fiore Duomo, the famed Ponte Vecchio (bridge), and the Santa Croce Church, where Dante and Michelangelo are buried. Puccini’s home in Lucca and his summer residence and burial site at Torre del Lago. A day trip to visit one or more of the small, quaint hilltop villages in the area – Siena, famed for the annual Palio horse race, Collodi (home of Pinnochio), Castelnuovo di Garfagnana, Pistoia, San Miniato, Bagni di Lucca and the nearby Ponte del Diavolo, or Vinci (Leonardo’s birthplace). 7 nights accommodation in a beautiful agriturismo. Tours of Lucca and Villa Reale. Hiking on the Via Francigena trail. Trip to a sea-side town. Transportation from your accommodations to tours. Does not include: Your airfare to/from Italy; airport transportation and transfers to/from accommodations; breakfasts, lunches, alcoholic drinks, two dinners and gratuities. Size of group: A minimum of three guests and a maximum of six. We require a minimum for this retreat to proceed and operate. We are not responsible for participant’s airline cancellation fees if this retreat is cancelled. Travel documentation and currency: Participants should be sure that their passports are valid and current, and are good for at least two months after departure from the United States. All prices for this retreat are in American dollars. Participants should investigate the current currency exchange rate and the lowest-cost way to convert their funds to Euro currency, which is used exclusively in Italy, before departing the U.S. or upon entering Italy. Bank ATM machines are available in the area. Exclusion of liability: Western Spirit Enrichment Center, Inc. (“Western Spirit”), a 501c3 non-profit organization, does not accept liability for any loss, damage or expense (including legal expense) resulting from a major event, that means unusual circumstances beyond our reasonable control or the control of our agents, suppliers or vendors, the consequences of which neither Western Spirit nor its agents, suppliers or vendors could avoid even with all due care. Such events include, but are not limited to: war or terrorist activities, threatened or actual, civil unrest, political upheaval, epidemics, riot, industrial action, threatened or actual, adverse weather conditions, fire, flood, drought, earthquake, traffic conditions or accidents, natural or nuclear disaster, closures, labor strikes, unforeseen alterations to schedules, changes imposed by rescheduling, unavoidable technical problems, power failures, or any other event outside Western Spirit’s control, the consequences of which could not have been forecasted, known or avoided. All retreat participants are required to sign Western Spirit’s liability release form prior to departure. A copy of the form will be furnished to you in advance and must be returned to Western Spirit before departure.